TauroPharm GmbH is a company specialized in antimicrobial medical devices. One of the company’s core interests is to offer a safe and effective technology for locking central venous access devices (catheters and ports). 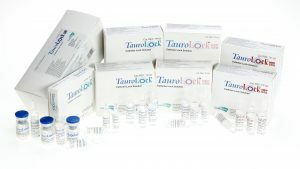 TauroLock™, a non-antibiotic lock solution, which is capable of dramatically reducing catheter related blood stream infections (CRBSI) is free of side-effects. TauroLock™ is highly effective in eradicating bacteria and fungi and has been successfully tested on more than five hundred organisms, including multiresistant forms such as MRSA and VRE. It is to be used in dialysis, oncology, intensive care and parenteral nutrition. To improve catheter patency TauroLock™ products contain 4% taurolidine, citrate and in addition heparin or urokinase.